Is Chipotle Mexican Grill Still Worth Its Premium Valuation? With Chipotle Mexican Grill already up 55% in the past year, it may be time for investors to take a step back and decide if Chipotle is still worth its premium valuation. Chipotle Mexican Grill (NYSE:CMG) has always come at a premium to industry competitors Panera Bread (NASDAQ:PNRA.DL), McDonald's (NYSE:MCD), and Yum! Brands (NYSE:YUM), but now is rapidly reapproaching all-time highs of around $620 in a year that has seen the stock rise more than 12%. With Chipotle slated to report earnings later this month, it may be time for investors to consider whether the company's growth fundamentals still merit its premium valuation. 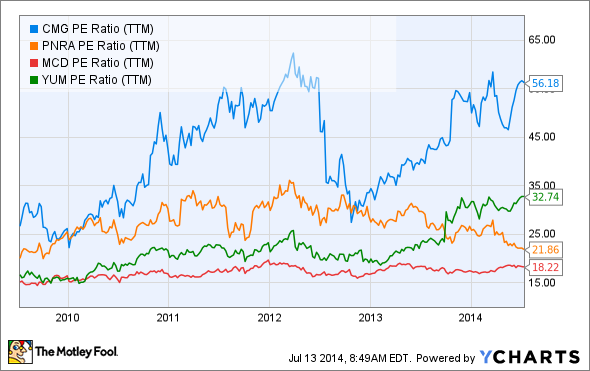 Chipotle has consistently traded at a hefty premium to its industry counterparts over the past half-decade. Rarely, however, has Chipotle's premium to its competitors been richer than it is currently. Yum! Brands, the next closest, trades with a P/E ratio nearly half that of Chipotle, and is currently only trading with a P/E in the 30's because of the massive hit Yum! Brands' KFC operations took in China over the past year due to the outbreak of a deadly strain of the Avian flu. Bottom line: Chipotle's valuation is currently incredibly rich on a straight up P/E basis. However, does Chipotle's growth still provide appropriate justification for this? A gander at the chart above shows that Chipotle is growing at an incredibly accelerated pace in terms of revenue, but EPS-wise has dipped down into the single digits recently. Chipotle's EPS growth rate, in fact, has been on a steady descent since 2010, when growth was above 75%. 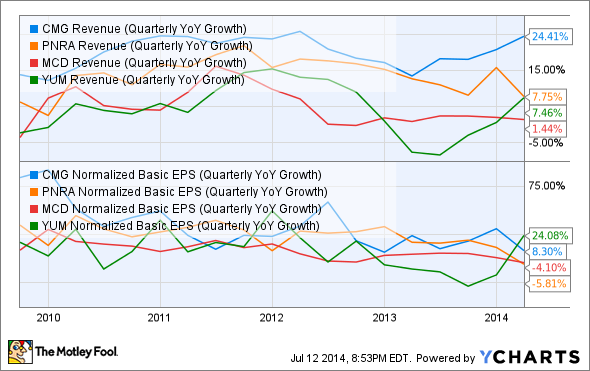 In the first quarter of this year, Chipotle only managed an 8.3% year over year EPS growth rate. In its first quarter earnings release, Chipotle cited a 150 basis point year-over-year increase in food costs, which accounted for 34.5% of its overall revenue in the quarter, as the primary cause of this slowing in EPS. It also cited a year-over-year 130 basis point increase in G&A costs (general and administrative expenses), which accounted for 7.4% of its overall revenue in the quarter. The bad news is that neither one of these problems are anticipated to go away. CFO John Hartung commented that despite the recent rise in food prices, beef, cheese, and avocado prices are expected to continue rising throughout the rest of the year, while G&A costs are expected to rise 50% year over year on an annual basis in 2014. To combat the rise in food prices, Chipotle recently implemented its first company-wide increase in menu prices in nearly three years, which will at least partially offset the recent rise in food costs. For the current quarter, Wall Street expects EPS of $3.05, which, if met, would represent 19% year-over-year growth. Meanwhile, the revenue forecast calls for a an astounding 42% year over year increase. How is Chipotle planning to sustain such growth past just the next quarter? Not only does Chipotle plan to open 180 to 195 new restaurants (roughly a 10% increase in total store count) this year, Chipotle also sports one of the best same-store sales (SSS) growth rates in the business. In the first quarter, when nearly everyone else was crying about how much weather conditions had negatively affected their businesses, Chipotle reported a SSS growth rate of 13.4%. Sustaining such incredible SSS growth will be key. For years Chipotle has been able to trade at a hefty premium to its peers because it sustained an accelerated pace of growth. While its EPS growth has marginally slowed recently, Chipotle has taken action to deal with some of its inflated costs, and a return to higher growth is forecast for the upcoming quarter. That's why, despite its premium valuation, Chipotle is still worth every penny. Investors must be cautious, however, for as soon as Chipotle signals that its incredible growth trajectory is slowing more permanently, Mr. Market will swap Chipotle's P/E in the 50's for one in the 40's or 30's. Something like this happening, however, is likely years down the road as Chipotle remains well-positioned to deliver astounding growth well into the future.